It seems that haul posts are becoming a regular thing on my blog lately over the last few weeks. Oh dear! I am not at all good at saving money nor can I resist a good ol' sneaky peek on Boots website, even when I have no money. Why do I torture myself? Anyway, after a long few hours of browsing through the site I ended up with a couple of things in my basket and headed for the checkout button and within a few days I had received my box of goodies. I have already started getting some use out of a few of these and I'm super excited to try out the rest of them. 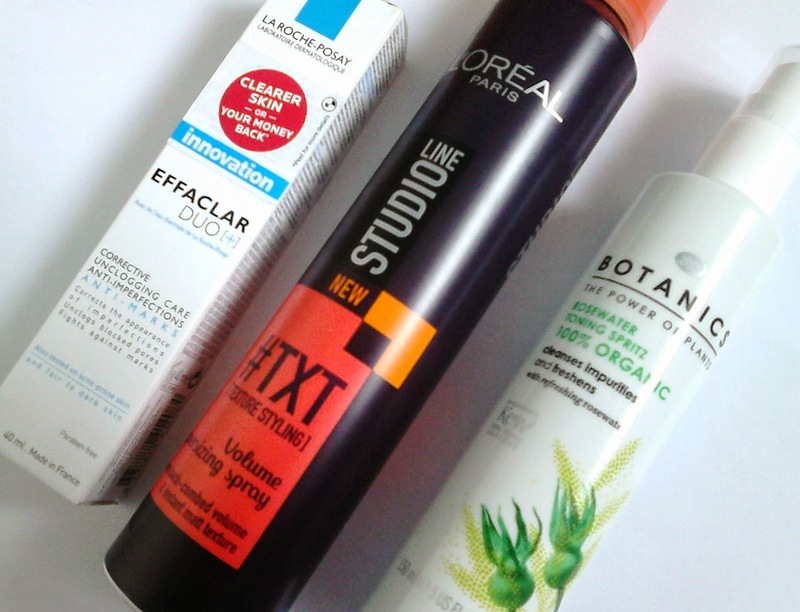 I have been running out of my La Roche-Posay Effaclar Duo+ so I had to purchase another. I can't do without this beauty, it is an absolute skin saviour for those with acne prone skin. I have a review up on this product here if you want to know more about it. I have short, thin hair and I really struggle to put some texture and 'oomph' into my hair. I came across soo many rave reviews about the L'Oreal Studio Line #TXT Volume Supersizing Spray so I had to add it to my basket. I am really looking forward to trying it out. The Botanics Rosewater Toning Spritz was a little bit of an impulse buy. It happened to be in the save up to 1/2 price skincare section and I added it to my basket. I have been using this in the morning and before I go to bed over the last few days and I am lovinggg it. Last february it was my birthday and I was really hoping to receive the Sleek by 3 Pink Lemonade as a gift but I didn't(cry face) so I decided to pick it up and I am so happy I have it. It is honestly so beautiful, I'm in love! I really can't wait to use it. I also got a pack of the Invisibobbles in white, they come in a pack of three. It was yet again an impulse buy but for £4.75 I couldn't resist. The majority of the time I have my hair up and I get really horrible kinks in it so this is a saviour. I'm sure you have more or less heard about this face mask millions of times, the Soap and Glory No Cloggs Allowed Super Self Heating Deep Pore Detox Mask. Phew, what a long name. Another impulse buy(shock!) but I had seen a lot of positive reviews beforehand. I am face mask mad lately, I can't wait to try it out. 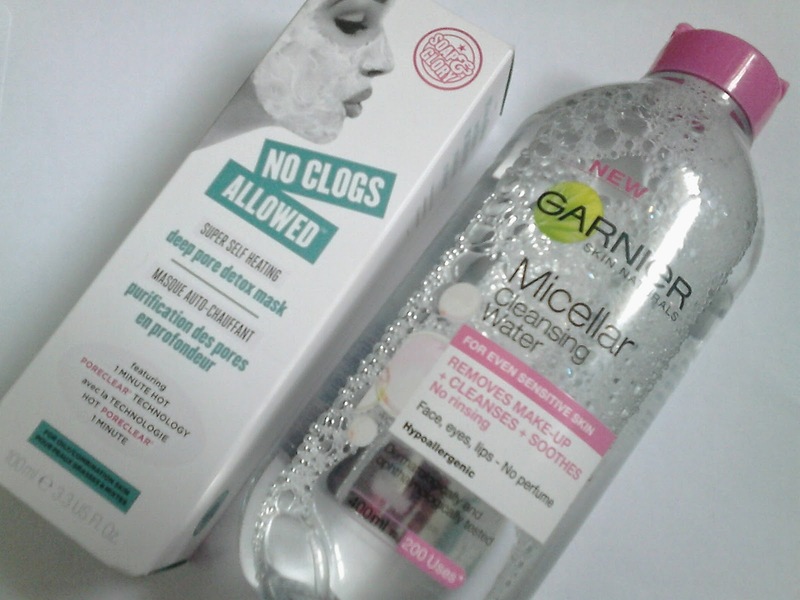 Last but not least is the Garnier Micellar Water. I was telling myself to steer away from the micellar water hype, it lasted until very recently when I spotted this in the save up to 1/2 price skincare section on the Boots website. I still haven't tried this out yet, it's a change from my normal cleanser.